We have a nice selection of rockets and launch accessories for sale. Some of the brands we carry are Estes, Quest and The Launch Pad. The Launch Pad makes some nice mid-power scale model rocket kits. To the left is a picture of 2157 Saturn V Flying Model Rocket Kit by Estes. This is a Limited Edition 1/100th Scale Model. Skill Level 4. Flies on Estes D12-3 Engine. Over 3 feet Tall and very nice scale model. 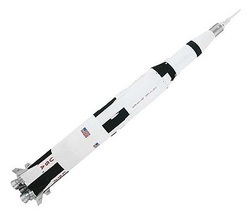 Stop in and see what other exciting rocket kits we offer.